For the first time in its history, Russian Energy Week’s Sporting Programme includes a tournament for one of the most energetic and emotional games – squash. 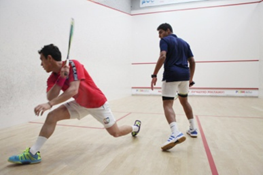 Squash is traditionally very popular among the international business elite and, in the last few years, has been gaining ground in Russia as well. The tournament will be held in Multisport Fitness Club, one of the largest squash clubs in Moscow. A good mood, energy boost, and new contacts are awaiting all participants . Participation in the event is by accreditation. Get registered at your personal web office.